Posted by jkahane in birthday, music hut, videos. One of my favourite musicians of all-time, Kate Bush, celebrates her 60th (!!) birthday today! I first started listening to the music of Kate Bush back in 1978 or 1979, with her first album, The Kick Inside (1978), a brilliant progressive rock album, with tracks such as “Wuthering Heights”, “James and the Cold Gun”, “Oh, To Be in Love”, “Them Heavy People” (a track I adore), and the title track. I can’t explain what it was about the album and her voice that made me fall for the singer and want to hear more of her work. The follow-up album, Lionheart (1978) (though I don’t think I heard this album until a year later, being in Canada as I was), was…remarkable, superb, and even better than her first one. “Symphony in Blue”, “In Search of Peter Pan”, “Kashka From Baghdad”, “Coffee Homeground” still resonate with me. Anyway, I’ve been listening to Kate’s music since she started, and am still a huge fan. I was also lucky enough to see her in concert back in the mid-1980s, and she is even better live. Enough already. To celebrate Kate’s birthday, here’s the video for one of my favourite tracks. Here’s wishing Kate Bush a very Happy Birthday! May she have a healthy, happy, prosperous, and blessed year ahead, and may a warm breeze always blow at her back. Posted by jkahane in board games, conventions, gaming hut, gencon, personal, rpg hut. Since I know that a lot of my gaming friends and peeps are going to this year’s GenCon 2018, and will be heading out sooner rather than later, I want to wish all of you a very happy GenCon. Posted by jkahane in board games, gaming hut, playing. 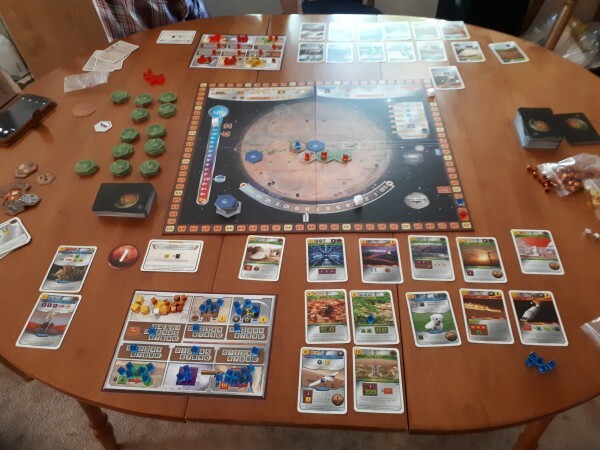 As mentioned earlier today, Tammy couldn’t make it out for gaming as she was on-call this weekend for her day job, so SteveR and I had decided we were going to play another game of Terraforming Mars this afternoon. SteveR came over in the early afternoon, and after a bit of snackage (okay, I had a late lunch!) 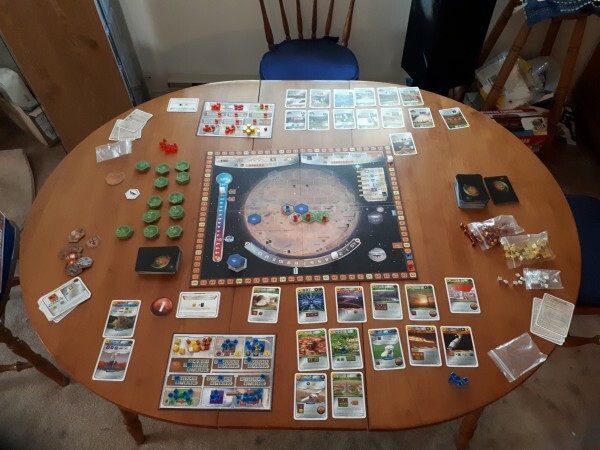 we got down to gaming Terraforming Mars. Set-up for the game today was a bit easier, since all the components were more familiar to us, and we got started. Still played as newbies with Beginner Corporations, but I’d had a chance to read the rules booklet through a couple of times this week, and we started in on the game using the proper rules for certain things this time around. 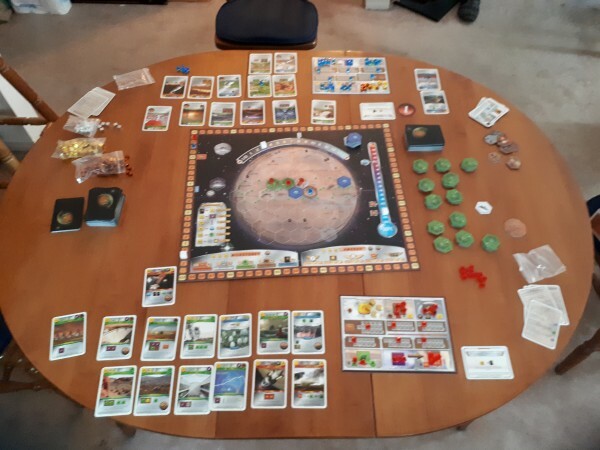 Anyway, we played a 2-player 3+ hours game of Terraforming Mars today. Right off the bat, I couldn’t get into a decent strategy as the cards I was getting just didn’t give me any type of personal goals that I could work towards or common themes that I could see. (Obviously, need to play more games of this!) I did my best to play to the energy sector (since that was where my strength seemed to lie), but soon realised that wasn’t going to help me in terms of furthering plans to terraform Mars (other than heat production, thereby raising planetary temperature) and get some steel and titanium into decent production. I managed a few things through the middle of our game, and started to make some headway in terms of plants and the like, but by then the game wrapped up. Overall, though, a fun game, but one that I felt very frustrated about for most of the afternoon in some ways. Posted by jkahane in board games, gaming hut, rpg hut, torg eternity rpg. I won’t be gaming this afternoon, sort of. Roleplaying game is off for today, as Tammy is still working on-call this weekend, so no Torg Eternity happening today. 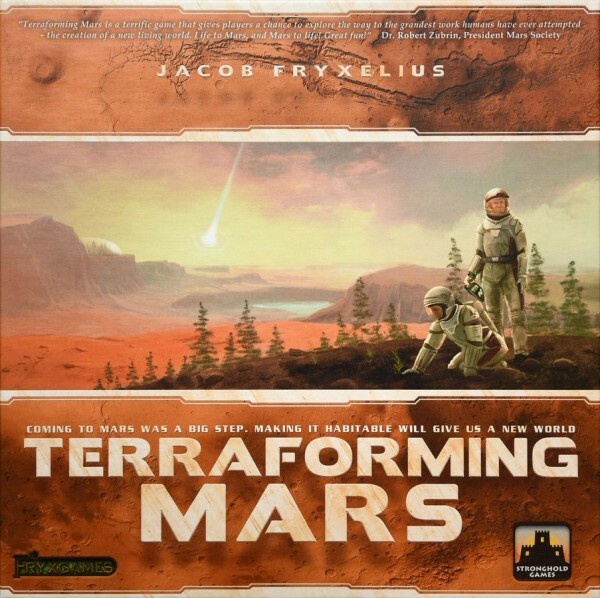 That said, SteveR is coming over this afternoon, and we’ll be playing some more Terraforming Mars today, so looking forward to that. Posted by jkahane in rpg hut, torg eternity rpg. The Friday night gaming group continued play in their Living Land campaign of the Torg Eternity RPG yesterday evening. You can read about the previous session of the game by following the link. This post is somewhat long, so I’ve put it behind a cut for those who don’t want to read about my roleplaying game campaigns. The next morning, the Storm Knights set off with the survivors and refugees as well as the Iceflower tribe of edeinos in the direction of Philadelphia. Lucas tells them that they are going to Trenton, New Jersey first, since they may be able to find a place for the survivors and refugees to stay before they proceed to Philly. When they arrive around mid-day in Trenton, they find the jungle has taken over the area but it is still clear that it used to be a city. They pass by an office building whose atrium is now filled with a giant tree, its trunk over four metres across. Continuing on in the eerily quiet ruins, they come upon a street that used to be filled full of shoppes. All the display windows are broken, and flowers of different colours spill out of the shoppes, each shoppe with different coloured flowers. As they go deeper into Trenton, the sounds of animal life become more pronounced. Galmok explains it is just the way of Keta Kalles. The Storm Knights and their allies are able to spot patrols of edeinos loyal to this Baruk Kaah, and manage to hide from them with the help of the Iceflower edeinos, who pretend to be loyal to Baruk Kaah and obscure the Storm Knights and the survivors from view. As the Storm Knights and their allies travel on, they come upon a gospog field but are prevented from wandering into it by Lucas, who spots it in time (after having been warned during the day’s travel with the Iceflowers about them and what they are). They stop on the edge of the field, but Wendy spots a gotak [one of the priests of the dead], and the gospopg are ripe for the picking – they explode out of the ground, and attack the group! Melanie Franconi doesn’t attack her gospog, but instead tricks it [making it Stymied] as she step around and to the left of it. Wendy Saltman strikes the creature with her staff, but injures it minimally. Sandra Mitchell is able to attack a gospog, but strikes it for minimal damage as well. Lucas Wells attacks the gospog with his machete, and manages to kill the creature [though he spends a Possibility doing so]. Hitting another gospog with his baseball bat (that he retrieved after losing it), Andar kills the creature in one clean blow [he used an Adrenaline card]. The gospog strike back, and both Wendy [who Soaks the damage completely] and Sandra [who suffers 1 Wound and 2 Shock after Soaking the damage] are injured in the attack. The fight starts to go badly for the Storm Knights, and one of the refugees dies as Andar watches, unable to help them. The fight continues, and the Storm Knights take down several more of the gospog. Sandra shouts to Lucas, pointing at the edeinos gotak, and with a huge grin on his face, Lucas fires his pistol at the surprised lizard-men priest, and kills the priest. With the gospog that emerged taken down and the gotak dead, Galmok comes over and congratulates the player characters. He tells them that they must burn the gospog field down to prevent its remaining crop from taking fruit. While the characters set about that, Andar mourns the loss of another of the survivors/refugees but is consoled somewhat by Emma Newman. The loss of the life, Andar tells her, diminishes the tribe, but she says there are other tribe members to be saved. Andar concurs, and the two join the others as they cremate the dead survivor, James Haddad. Lucas says they shouldn’t stay in the area, as the gunshot that he fired and the smoke from the flames is sure to draw an edeinos patrol or two. Galmok concurs, and the humans and edeinos continue on their way, skirting the burning gospog field. The Storm Knights and the survivors/refugees stop for a bit, and Galmok inquires what is wrong. Andar tells them the humans must rest and recover somewhat from their experience in the gospog field. Once the group is ready to forge ahead, the edeinos point them in the right direction, Andar and Lucas having been thrown off by the sheer amount of foliage and no landscape markers. Andar tells the characters that there is a river nearby; when Wendy asks how he knows, he just points at his nose and grins. As they continue to travel, the sound of gunfire echoes through the air, coming from the direction of the river. Wendy and Sandra are excited, but Lucas advises caution although he’s obviously itching to check things out since the sound of gunfire indicates more humans and perhaps another hardpoint. Galmok says he can send two of his scouts to check out the situation, but Lucas tells him it’s better if a couple of the Storm Knights go and the rest remain with the Iceflowers and protect the survivors/refugees. Andar and Melanie head off into the jungle, exercising caution, and soon find themselves in a residential section, now overgrown, apart from a red brick building with a turret, at the intersection of two roads. Melanie recognizes it as the Adams and Sickles building. There are about two dozen people inside, about half of them armed with guns, three of them obviously police officers (despite their tattered uniforms). Outside the building, there are a large group of edeinos (Melanie counts at least 50 of them) using trees and rusting cars for cover, while another half dozen more are flying overhead on lakten. Melanie points further down the road, where a small house with shadowy figures (maybe five?) are hiding from the carnage outside. She tells him there are at least half a dozen edeinos keeping an eye on the house, but they don’t seem willing (or able?) to rush it. The two head back to the rest of the Storm Knights and bring them up to speed with what they found [they both made Maneuver and Stealth rolls to leave the area undetected]. Lucas says that they need to go help the humans, and says that the building hardpoint will give them an advantage. The group of Storm Knights and the Iceflower edeinos head to the area near the Adams and Sickles building, all using stealth [only Sandra and Wendy failing the rolls], and successfully make it back to the area. After a quick recce of the area, Lucas tells the others of his plan. He and Wendy and Sandra will go and take out the edeinos near the house and free those inside. Andar and Melanie will join the Iceflower edeinos and and get the people out of the building and away to safety. Using her Repel miracle, Wendy tricks one of the edeinos to follow the “waving vegetation”, thinking it’s a foe moving, while she then clubs another of the edeinos to the ground, knocking him out. Sandra uses a trick of her own, throwing a branch into the forest and an edeinos follows it. She then attacks a second edeinos, and kills it quickly using her spear [she spends a Possibility and a Coup de Grace card]. Lucas attacks another of the edeinos, killing him instantly and then strikes a second one, and taking him down as well. A door to the house opens, and a black man in his early 40s emerges, holding a police special in hand. Back at the Adams and Sickles building, Andar, Melanie and the Iceflower edeinos attack the edeinos laying siege to the building, and a brutal and bloody battle is waged. By mutual consent, Andar and Melanie make their way towards the building’s only entrance while the edeinos engage Bauk Kaah’s loyal forces. Andar and Melanie take down two edeinos each as they make their way to the structure [both spending Possibilities and taking Multi-Target bonuses and spending a couple of Coup de Grace and Adrenalin cards as well], and reach the building as the edeinos are forced to take on the Iceflowers on the ground and in the air. Melanie explains to one of the defenders, Freedman, what’s happening, and he shouts for everyone inside to get ready to leave. As the attacking edeinos thin out, Freedman and another of the police officers, Taggert, gets everyone – some two dozen, including several women and children – out of the building, and around to the rear. A trail leads from there, and Freedman says that it goes down to the Delaware. The black man introduces himself to Wendy, Sandra, and Lucas as William Hayes, and says that he’s grateful to them for helping him out. Without a word, he points the police special at Lucas, and fires – striking the edeinos that was about to attack a lethal blow. Wendy has the oddest sensation about Hayes, but can’t identify it. Hayes says that he doesn’t understand what’s been going on or why the guns work for him, but he’s a former cop and has gone back into “protecting the people” mode. Wendy and Sandra usher the other four people, all young boys and girls, out of the house, and tells them they’ve got to go, even as gunfire erupts from the Adams and Sickles building. Hayes, with Lucas closely following him, leads the group round the house, saying there’s a trail that goes down to the Delaware River. If they can make it, that’s where the other folks will try to make for. They reach the trail behind the Adams and Sickles building just as everyone else comes running towards it. As introductions are made all around, Freedman and company tell the Storm Knights and the Iceflower edeinos who join them how grateful they are for their help. The waters of the Delaware are an iridescent green, and the Storm Knights can see that there are fish – and some larger things – swimming in it, things the characters have never seen before. Freedman and Hayes tell the Storm Knights that the river flows straight to Philadelphia. The Iceflowers that accompanied them to the river, including Galmok, tell the Storm Knights they need to keep a low profile for now, and can only buy the Knights a few minutes before the other edeinos will regroup. Lucas offers Galmok his hand to shake, and the edeinos sees what this means and returns the gesture. His claws nick Lucas’s flesh, drawing blood [1 Shock]. The edeinos quickly vanish back into the forest. The Storm Knights realize they have to find a shelter for the survivors/refugees, old and new, before they can find a boat or some other vessel to go down the Delaware. [This is a Dramatic Skill Resolution.] The group fans out, and a couple of minutes later Lucas finds a shallow cave [that opened up in the Axiom wash] that is suitable to hide all the refugees and survivors. The Storm Knights next task is to search for a boat, and it is Sandra who finds a boat after several minutes searching near some docks. The boat is able to carry just over 2 dozen people, but Sandra realizes they can also take the smaller boat that she found for the rest. Lucas and the other Storm Knights are able to bring the larger and smaller boats over to close to where the survivors and refugees are hiding in the small cave. [Lucas has to spend a Possibility and an Action card to do so. Melanie does a smooth job with the smaller boat.] Wendy and the others realize they have to get the survivors/refugees to the boat, and when they attempt to do so, many of them are afraid as neither the boat nor the river look very safe. Lucas makes an impassioned plea to the survivors, backed up by the other four Storm Knights [and using a Drama card and three Supporter cards! ], and convinces them to trust the Storm Knights. The survivors/refugees board the boat(s). Lucas boards the boat with the survivors, while Wendy, Melanie, and Andar along with two survivors board the smaller boat. As the two boats cast off from the shore, a large group of edeinos appears near the edge of the river. They throw several spears at the Storm Knights and the survivors, barely missing, though several of them impale themselves in the boats’ hulls. When the two boats arrive at Philadelphia they are met by soldiers at the docks, who are very glad to see refugees from the Living Land. Word spreads quickly, and people hurry to the docks. The Storm Knights witness several family reunions with people from the Adams and Sickles building. Amanda, the mother of Michael (the boy scout) is also there, and she demands to know what has happened to her son. Wendy and Sandra take her aside, and she becomes resentful of the Storm Knights when they tell her what happened. Their retelling of what happened to them inside the Living Land turns them into heroes of the people, and the officials and military of the city offer them leadership when they mention the tribe of friendly edeinos. Lucas and the others turn the offer down, as they would prefer to go out and save more people and find new friends and resources in the Living Land. Andar tells the others that he cannot live in this “dead place” (Philadelphia), and that he will stay close to the city so as not to leave his “tribe” on their own. The Storm Knights prepare to take some time off. Melanie says for the moment she just wants a bath. Wendy says that she needs to get hold of a bicycle. Sandra asks where the nearest library is. Lucas says that he wants to have a nice hotel suite for a little bit (and winks at Jessie Haller). And Andar? Well, who knows what Andar wants these days…other than a tribe of his own, and a haunch of some sort of beast to eat. Friday night’s game session of the Torg Eternity RPG campaign was a lot of fun, and it wrapped up the players’ second adventure with the game. The session ran a bit longer than planned, as the players were having too much fun and wanted to get to Philadelphia and wrap things up on the adventure before we ended for the night. When we wrapped up for the night, the players told me that they had really enjoyed themselves, even moreso than during the first adventure, and that they like the system even more than they did at the beginning. Peter said that he’s really come to love the simplicity of the game mechanics (though the Destiny and Cosm cards have taken some getting used to), and he’s looking forward to what comes next for Andar and the others. Posted by jkahane in board games, conventions, gaming hut, gencon, health hut, music hut, rpg hut, videos. I’ve been giving some thought to all things GenCon Indy at the moment, given that the convention is just about a week away. Thought that I would pass along a simple piece of advice: Remember the 5/3, 2, 1 Rule of GenCon. This means that in every 24 hours, get at least 5 (or 3) hours of sleep a night, 2 meals per day (at least one of them should be hot), and take 1 shower per day. And these are minimums, folks, bare minimums (at least for some people). Following this basic guideline will keep you alive through the convention, maximise your time for gaming, and allow for the comfort of those with whom you are gaming. Please, please, please take a shower and use deodorant, folks. Oh, and no matter what you think, cologne/perfume cannot and does not make up for the lack of showering. Posted by jkahane in food hut, rpg hut, torg eternity rpg. Getting ready for Friday night gaming. It has been one of those weeks that I’d like to forget for the most part, and to be honest I’m looking forward to relaxing a bit this weekend and trying to get some pain relief. That said, tonight’s game is something that I’ve been looking forward to all week. 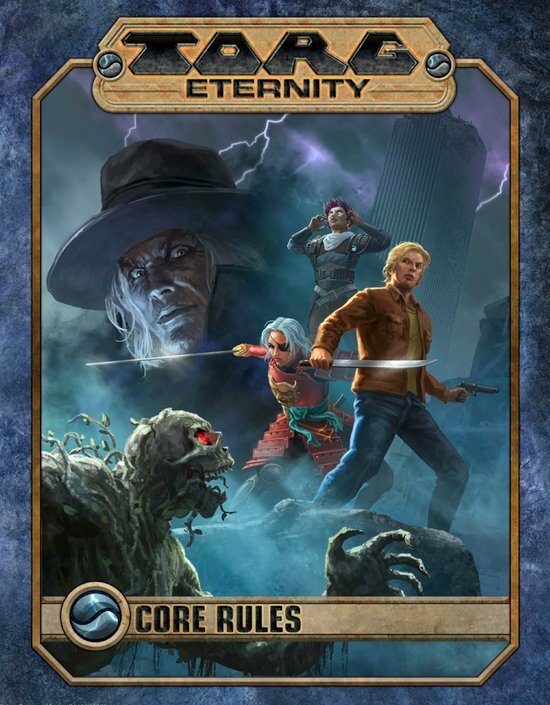 The Friday night gaming group will be continuing their Living Land campaign of the Torg Eternity RPG this evening, and Kathy told me that everyone’s looking forward to this evening’s game session. All the players will be here this evening, so I’m looking forward to the game tonight. In the meantime, Kathy and my goddaughter have just arrived, and now we just wait for the pizza to show up for supper. Posted by jkahane in board games, conventions, gaming hut, gencon, rpg hut. Looking at the calendar, I see that today is the 26th of July. This means that GenCon Indy starts exactly a week today. Dear Goddess, where has the time gone? I have to say that I’m not going to Indy for the convention this year due to some health issues but primarily due to a lack of finances for it. The convention has just gotten so expensive and so much more expensive to attend every year, and the killing the Canadian dollar is suffering under isn’t helping at the moment. And to be honest, I’m having nightmares about the blistering that my feet took at GenCon last year. So, no, not going this year. Posted by jkahane in home problems, house, personal, photos. The rain has been coming down for days now here in the Ottawa valley, and today I have started paying the price once more. 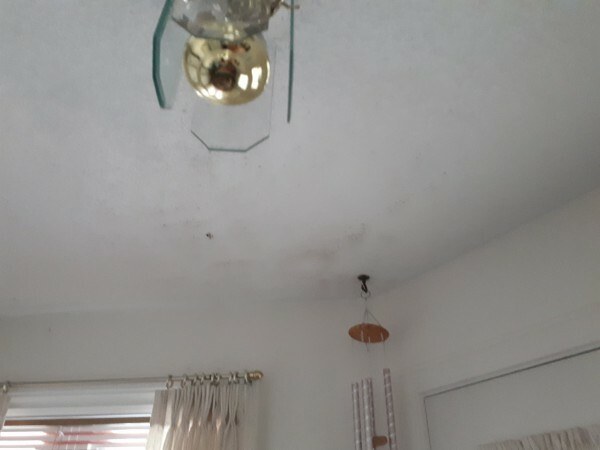 Last year, I had the problem where water was leaking into the ceiling in the entryway of my house, but the condo corporation had supposedly fixed the problem from the outside, although they never got around to doing the repairs that needed to be made inside the house (specifically in the ceiling of my entryway). Now, the problem has returned. There has been a lot of rainfall over the past few days, thunderstorms included, and the water decided to start dripping copiously into my condo unit’s entry hallway. Here’s a picture of the ceiling. You can see some of the water stains and a few bubbles in the ceiling material, if you know where to look. In the meantime, towels all over the floor in the hall entryway and a bucket (hopefully) placed strategically for the worst of it. Well, as I mentioned yesterday, since Tammy was off working on-call for her job, there was no roleplaying game session. 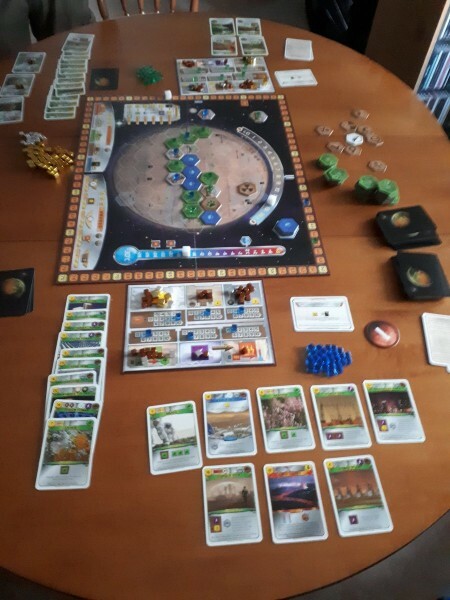 Instead, SteveR came over and we played a game of Terraforming Mars. I’ve only played a game or two of the game, and have never cracked open the game box that I had bought around a year or so (maybe? Can’t remember when I bought it. Too much else on the go.). Overall, had a lot of fun learning the game, though it was also frustrating at times. Lots of cards in play, and as you can see, even with a 2-player game there just wasn’t enough room at the game table. On top of that, learned we got at least 2 of the rules wrong. One of them is pretty obvious from the table of play, so can you spot it? The other rule had to do with Actions during the Generations.